The best way to arrive in Meran is by train from Mals. You will first see the city from above, near the town of Marling. The train will slowly wind its way down the valley to Meran, giving you a good view of the area. Meran itself is only about 325 meters above sea level, meaning that the train from Mals has to descend about 175 meters in its sixty kilometer long route. Looking north-west at Meran from the Botanical Gardens, 2018. The mountains around Meran are very imposing, soaring up well past the 3,000 meter mark. We arrived on a cool day, where it had been raining off and on in the valley – which meant there was a little bit of snow on the highest peaks. This made the stunning views even more wonderful as we pointed out snow-capped peaks and waterfalls to each other. View from the city of Meran, looking north, 2018. Meran is an incredibly easy town to get around in – if you are on foot or are going by bike. Parking seems to be mostly for locals, and while there are bus routes just around Meran, you don’t really need them. We stayed at the Garni Villa Betty, which is just outside of downtown and had no problems walking around and seeing the sights. We had two reasons for picking the Villa Betty, the location and the breakfast. 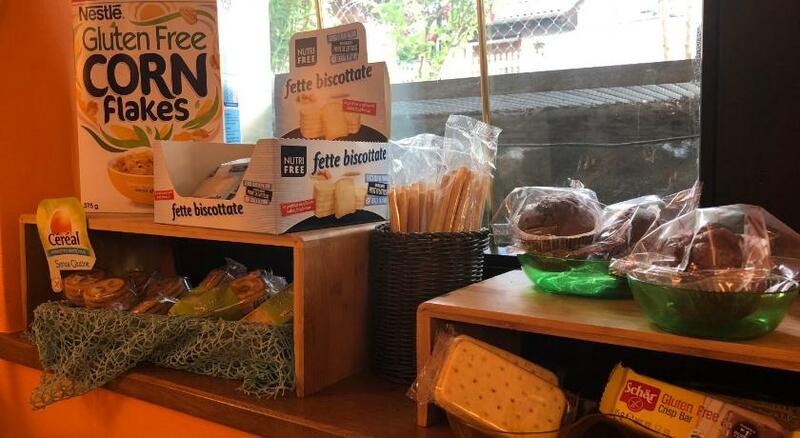 Between the photos of cheeses and meat, a photo of a fancy coffee machine, Booking.com has a photo of various gluten-free items, all individually wrapped. I was always too sleepy to take a photo, hence the link. I admit to not being a breakfast person. I need my coffee, maybe something light to snack on and that’s about it. My boyfriend and constant travel companion is the exact opposite. He needs his breakfast, and preferably a large one at that. The Villa Betty worked out perfectly in this regard, there was very good coffee – with one of the staff on hand to work the machine – as well as a wide variety of options for breakfast. I usually had some of the fette biscottate, which is a hard bread that I broke up and dipped into marmelade. Admittedly, the Villa Betty is not for people who need quiet to sleep. It is on a fairly loud road, with constant traffic. Had we needed the A/C on, I think it would have been fine, but with a window tipped open, it was louder than I had expected. Still, a pleasant stay. Next up, the Happy Pomodoro! Note: some links may be affiliate links and will help me with the costs of running this site, at no extra cost or inconvience to you.